If you are an adult who needs braces, you may be apprehensive about getting big metal braces that are not aesthetically pleasing to the eye. You want to feel confident about your smile not only after your braces come off, but during. Invisalign invisible braces provide straightening treatment while looking your best! 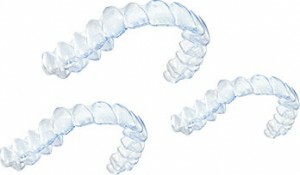 Invisalign works by using a series of custom-made, nearly undetectable aligners. Whether your teeth are crowded, too far apart or have shifted, Invisalign may be right for you. Upon an initial examination, Dr. James Yankowskas DDS of Tyngsboro, MA will decide if Invisalign is right for you. He will then write a treatment plan and take an impression of your teeth. Thanks to the latest advances in 3-D computer technology, Invisalign carefully translates Dr. Yankowskas’ instructions into a series of precisely customized aligners. The aligners will move your teeth gradually week by week until you achieve the smile you have always desired. Also, it’s important to remember that even though you may want to straighten your teeth for cosmetic reasons, straighter teeth and a proper bite are beneficial to periodontal health. Don’t wait another day! Get those braces you’ve always needed without compromising your confidence. Make an appointment with Dr. Yankowskas today at 78-649-7773 or www.tyngsborocosmeticdentist.com. Porcelain veneers are one of the top cosmetic dentistry procedures and you want them to look beautiful and function for as long as they can. The longevity of your porcelain veneers greatly depends on how well you take care of them. Dr. Yankowskas DDS of Tyngsboro Cosmetic Dentistry offers some suggestions for properly taking care of your porcelain veneers. Good Oral Care at Home: Brush and floss daily with a nonabrasive toothpaste containing fluoride. Good oral care at home helps prevent periodontitis which can cause your gums to recede. Veneers are placed right at the gum line. If your gums do start to recede the appearance of your veneers could be compromised. Avoid excessive force: No biting your fingernails, hairpins, ice or hard candy. These types of things can break or dislodge a veneer. No clenching and grinding your teeth: By grinding your teeth your veneers can be chipped or broken due to the force generated by these actions. If you suffer from bruxism at night, talk to Dr. Yankowskas about a night guard to protect your teeth and veneers. Steer Clear of Staining Foods and Drink: Although porcelain veneers are very resistant to staining the cement used to hold them in place can stain over time. Try to avoid coffee, tea, soda, wine and tobacco. Contact Tyngsboro Cosmetic Dentistry at 978-649-7773for more information on porcelain veneers or to make an appointment. Visit the website www.tyngsborocosmeticdentist.com.